I must admit that this is a long overdue post. 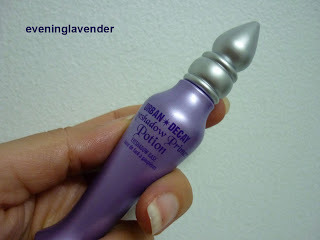 I bought this Urban Decay Primer Potion (UDPP) upon the recommendation by Nikki of Ask Me Whats and Connie of Skin Deco who are also fellow beauty bloggers. I must thank them for their good recommendation. I actually consulted them before making my purchase. It so happened that my friend from US was coming back for holiday. So, I quickly ask her to grab one for me. Actually, I have been searching for a good eye primer for my super oily eye lid. 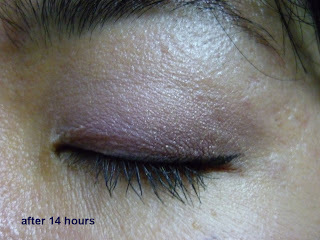 My eye shadow will crease after 5 hrs of application. That means around lunch time, it will start melting away. It is quite frustrating actually to see the ugly creases and mess. Do you have this problem too? Previously I have tried Elianto, it does not work for me. I tried using Elianto eye primer without using eye gel / eye cream but the result is the same. I actually do not hold any high hope on UDPP because I have super oily lid but to my surprise it delivers and I will definately repurchase. This is a product for fellow beauty junkie who have oily lid. But remember this is after 14 hrs! At first I use this product without using eye cream, I find that it is too drying, there is some peeling of skin on my lid area. So, I tried using eye cream before applying UDPP, to my surprise UDPP also performed when the eye cream is used. Just make sure the eye cream is dry before applying UDPP. Does it deliver its promise: Yes definately, This is my HG eye base for now. But something to alert you, the product packaging will not allow you to finish the last drop of the product. 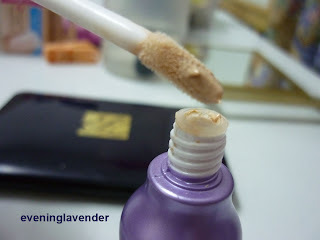 Some bloggers reported that they cut the bottle into half and scrape out the product into a small container - not wanting to waste the product. Maybe I'll do the same when the time comes. Have you tried this before? I heard that ELF eye primer is quite good for oily lid but I haven't got the chance to get hold of it yet. Has anyone tried ELF eye primer before, pls share your opinion here. 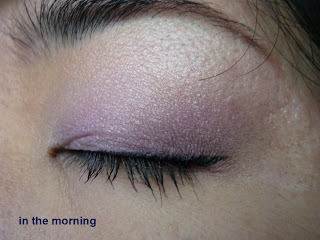 I love UDPP :) it works great on my oily lids, and stands up to me sweating (ew) in the horrible Aussie humidity. Wow, the result looks awesome! this brand you mention too expensive for me. yes this product is a bit pricy but I think it can last a year if used daily. Yes Witoxicity, you must try this one day. i tried udpp :) and elf primer! thought i dun have oily lids so it's hard to compare notes. Elf primer works as well but udpp is much better! in texture and long lasting for e/s. The elf after 4 hours, my lids begins to be dry a bit and i feel uncomfortable & itchy. Well thats probably bcoz of the weather and my skin type? I'm now using Stay Don't Stray from Benefit, which they say is a 360 degrees eye primer (for eyeshadow n concealers!) and works fine from morning to night. I sample it and yeah =____= very long lasting! but it's creamier than udpp in texture. Maybe u should try the Stay Don't Stray n compare. I wonder oily lids still good for STay Don't Stray?